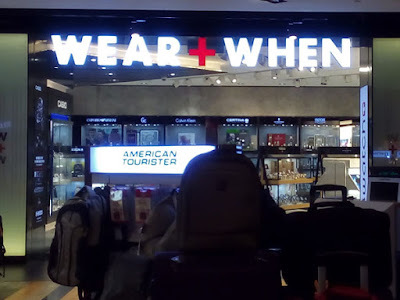 It doesn't matter where, as long as I know what to wear and when we're going. Spotted in Kuala Lumpur International Airport (KLIA2). When I first learned that Canso X had a hiking trail (through the AVP they showed during their soft opening in 2014), I was excited and promised to come back for it. Nine months rolled by then 2014 was over. 2015 came and went. Seven months into 2016 before I finally fulfilled that promise. A 45–minute ride from the city, the v-hire (van) dropped five of us off at the entrance of Canso X. We were welcomed by Sir Raffy Osumo, the head of Canso X, like we were old friends. He gave us a short orientation, introduced the two guides, let us don our helmets and life vests, and wished us a fun hike. Wearing our life vests while hiking! The hike started off easy along a slightly sloping trail. 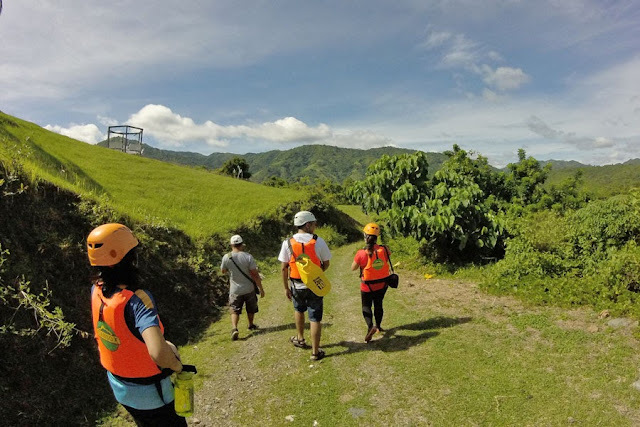 But the easy hike coupled with the hot sun and the not so great idea of wearing helmets and life vests while hiking made us sweat like a waterfall just a few hundred meters into the hike. Whenever there was shade, we would stop to catch our breath and quench our thirst. When we reached the river (or more like a stream), we happily waded in to cool off. Not much later, it was back on the mountain, uphill and downhill, passing by a carabao (water buffalo) that was cooling off in its little pool. 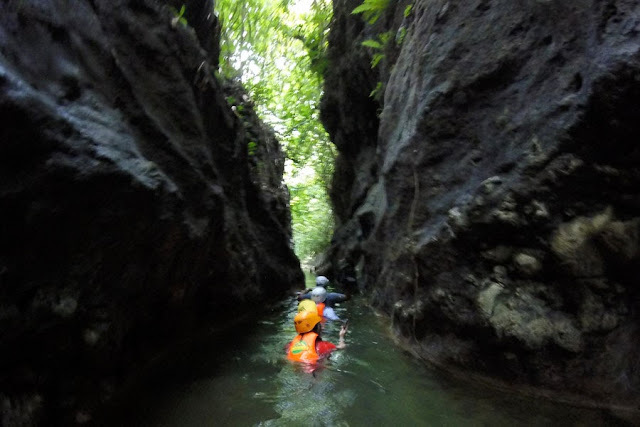 Excitement and nervousness came when we reached the area where the only way forward was to scramble down, get in the water, and swim to the other end. And swim. And scramble. And swim. From there on we were all grinning as we scrambled and swam, scrambled and swam, moving forward and gaining distance. And then our grins turned into nervous laughter when we reached a drop, gazed down at the emerald water, and was told the only way down was to jump. It wasn't high, mind you, but enough to make us ask ourselves why we ever agreed to go on this hike. I volunteered to go first, not because I had no fear, but because I was sure I'd get more nervous if I watched so many people jump. A short jump. Just two seconds in the air and into the water. I am proud to say we all did it (we had no choice). Even our friend who turned out to be afraid of jumping and who swore after that she would never ever do it again. 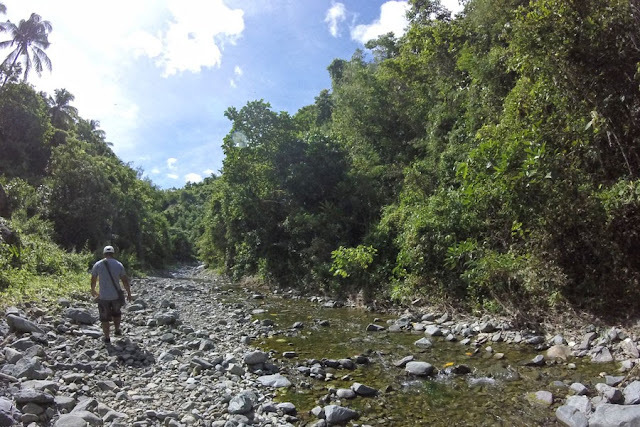 After that it was all easy breezy, hiking along the stream, and back on the mountain, walking uphill on grass towards Canso X where our Balamban liempo was waiting. Please call between 8AM to 5PM only. 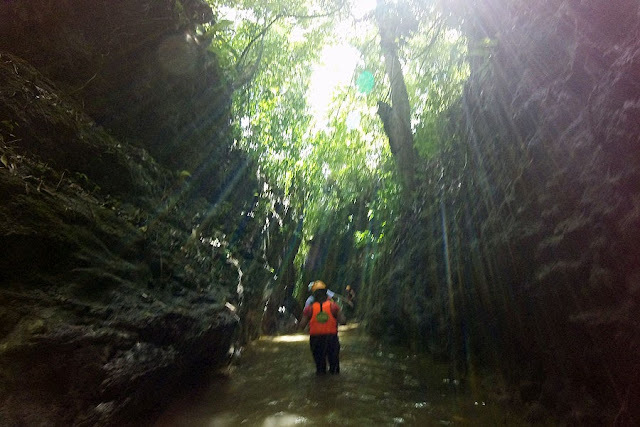 The hike in Canso X is a good start if you're too scared to try the Alegria/Badian canyoneering. 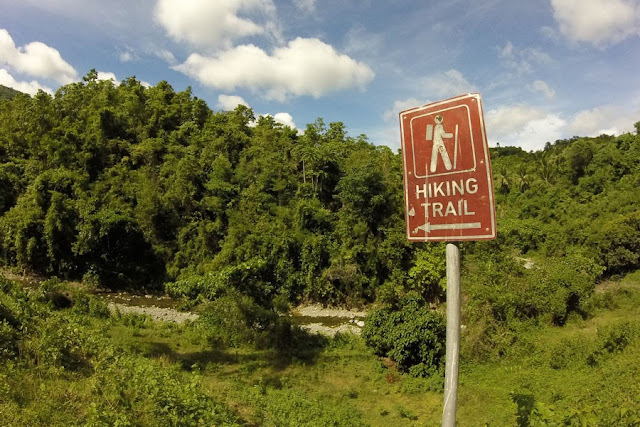 The hike follows a 4.5–kilometer trail that can be completed in three to four hours at a leisurely pace. It is recommended to call a day or two in advance so they can prepare the gear. Start the hike as early as 7AM. Note: On Saturdays, it is possible to catch empty v-hires on the way to the city. On Sundays, you might have to go to Balamban and take a v-hire from there. 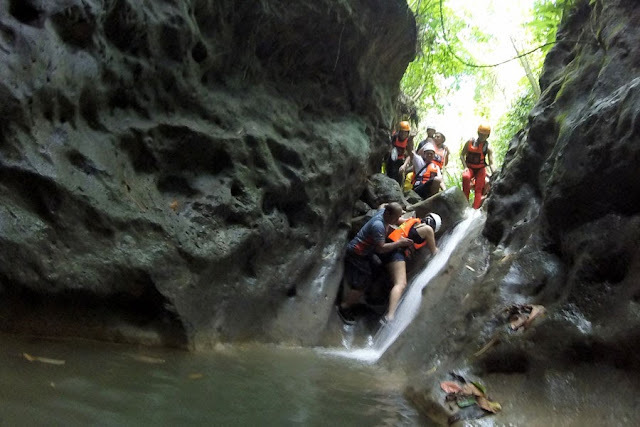 When near bodies of water, place your gadgets and important things in waterproof bags and/or secure them. And of course, never place your wet stuff in the same bag as all the other things that you have been trying to keep dry. During a trip to Balabac, a friend lost two things on different days. First, his sunglasses fell in the sea without him noticing. Second, his smartphone fell from his pocket while he was helping another friend board the outrigger boat. He was able to fish the smartphone out, but it was beyond repair. The second advice is common sense. But sometimes, in excitement, common sense escapes. Like in the case of another friend who had stuffed her dripping snorkel in the bag where she had her smartphone! RIP (rust in peace), smartphones!